A few weeks ago, PGA golfer Hunter Mahan left a sporting event to be at the birth of his child. 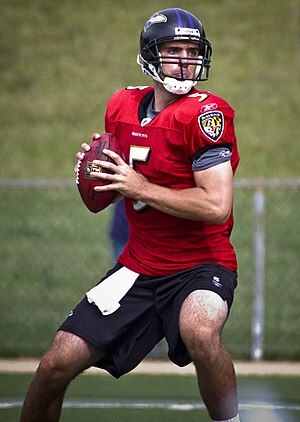 Last week, NFL star Joe Flacco chose to play. Why I support both of their decisions. Real progress for working dads comes when we have choices and can thoughtfully make work-family decisions that work for us. Over the past few months, I praised high-profile new dads who made public actions to prioritize family over work. Of particular note was pro golfer, Hunter Mahan, who left a tournament he was leading (and in which he could have won $1Million) to be at the birth of his daughter. He made a high-profile choice that, in my opinion, sent an important signal about fatherhood. I was especially encouraged by the support Mahan received from the golf and sports world. Last week, Baltimore Ravens star quarterback Joe Flacco was faced with a similar dilemma. His wife unexpectantly went into labor shortly before the Ravens’ game against the Cleveland Browns. Flacco talked with his wife and other family members over the phone, but did not leave the stadium for the hospital. Instead, he played, leading the Ravens to a much-needed victory. As soon as the game ended, he sped to the hospital, a few hours after the birth of his son. While Flacco was not widely criticized, some expressed disappointment in his decision- Imagine the attention to the importance of fathers, work and family issues that would have come if Flacco had left during pre-game warm-ups to be there!!! We’ve come a long way when a $20 Million-dollar-a-year athlete faces mild criticism for NOT leaving his team at the last minute for family reasons. I think Hunter Mahan made the right choice. I think Joe Flacco made the right choice. Why? Because both choices were thoughtful, were based on communication with their spouses, and were the right decisions for them. Flacco was interviewed for CNN the other day to discuss the situation. Based on the interview, it is clear that Flacco is a loving dad who made a thoughtful decision based on full communication with his wife. How can I criticize that? Why would I want to? A screencap of Flacco’s interview with CNN’s Rachel Nichols. Click the photo to watch the video. You really should watch the video. At about the 1:30 mark, he addresses missing the birth. At about 2:00, he discusses Hunter Mahan and how their situations differed*. At about 3:00, he discusses how progress from just a generation ago means that dads have more chances for family involvement today. Great stuff all around. Despite my initial disappointment, Flacco made me realize that this is what progress looks like. Real progress for working dads comes when we have choices and can thoughtfully make work-family decisions that work for us. So if a pro athlete chooses to miss a game to attend child birth, that’s fine. If he chooses to play, that’s fine, too. I hope more dads can discuss these issues and make the right choices for themselves and their families. We can respect people’s choices, even if we may have acted differently. Progress means that today, more and more dads have the choice on how to balance their work and family lives and that it is far more acceptable for us to seriously discuss these matters. Could you imagine the outcry from the football world if Don Meredith, Roger Staubach or even Troy Aikman considered missing a game for “women’s stuff, like babies and all” (everyone would still pile on Tony Romo, however). 1. We never know the whole story from the outside (work or family pressures, etc. ), so I will not criticize dads on their parenting or work-family decisions (except for egregious or harmful decisions). This goes double for dads who don’t have the financial security or work flexibility that some lucky dads have. Finally, as I was when the Hunter Mahan story broke, I am very encouraged by the reaction from football fans and media. We have really come a long way! I don’t fault Joe Flacco, or any other dad who is trying his best and making thoughtful work-family decisions. Like the article? Think it would make for a good facebook, reddit or twitter conversation? Then please share it using the buttons below. You can also follow the blog via email, facebook or twitter. Thanks! * Flacco is the face of the franchise for a billion-dollar business and is the highest paid and most important player on his team. Being quarterback also means being the team leader. He has 53 teammates and a large organization for which he is responsible. Football plays 16 times a year. Mahan, as a pro golfer (an individual sport) is really a one-man business, responsible only to himself, and can play over 30 tournaments a year. This kind of communication – or lack of it – can make or break a marriage and thereby make or break a family unit. And you’re so right to point out that we can never know what is right for any couple or family, from the outside looking in. Thanks, DA. I agree there is no one best way- just the way that works for the family unit in question. As long as everyone discusses things and makes conscoiious choices, most decisions will work out well. I think you make a good point here Scott. Ultimately, the decision was right for each athlete and they did after much though and consultation with their spouses. Sounds reasonable, wise even. Yep. The tendency of advocates like me is to root for folks to do what serves our agendas. Ultimately, Flacco’s situation made me see that my agenda is not really for all fathers to have the exact same priorities, but rather is to promote a careful decision making process when it comes to work-family decisions. I agree with you about it being to wrong to criticize someone such as Joe Flacco for doing what he did without taking into account the fact that he had talked about it with his wife and they appeared to have agreed on it. My initial reaction was that I hoped that Joe Flacco hadn’t taken the decision that he did because he felt pressured to play in the game or because he felt that he would be liable to be criticized if he decided to miss the game in order to attend the birth. In some was, I can understand him feeling that he had responsibilities towards his team mates and his team’s fans. However, I think that parallels can be drawn between sports starts and those of us in supposedly less glamorous professions such as university lecturers and professors 🙂 Being in the UK, I was legally entitled to two weeks of paternity leave and I took them. I did think about the practical implications for my colleagues and my students such as the disruption or inconvenience it would cause them. However, for me it all came back to that key word of communication. In order to be entitled to take my paternity leave, I had to inform my line manager at least 15 weeks before the due date (which I did). As it happens, I also did things that I wasn’t required to do but thought would make everyone’s life easier. I had my discussion with my line manager when my wife was about 14 weeks pregnant after we’d had the 12 week scan and talked about when my leave was likely to fall and some ways I could try to minimise disruption. At the start of the second semester (late January 2013), I explained to my students that I would be going on two weeks of paternity leave during the second half of the semester but couldn’t be sure exactly when. So as I wouldn’t have too many classes to catch up on in a short period of time after paternity leave, I brought forward a few classes so as I’d be less likely to have to cancel them. Students were really understanding about this and the fact that I did end up having to cancel some classes at short notice (or have some really kind colleagues stand in for me). In the end, I taught quite a lot of re-arranged classes in a fairly short space of time during a week that was supposed to be a revision week (i.e. a week in which normally there’d be no lectures). The timetable unit and my colleagues were really helpful when it came to setting this up and my students were fine with this and the vast majority of them attended these re-arranged classes. I tempted to do another paternity leave post sometime where I talk about the practical implications of taking paternity leave. If I do so, would you mind if I use some of what I’ve just posted here? First, thanks for s haring this great comment. Of course, you can always use your own words. I’m sure Flacco and his wife were very aware Of the public pressure and incorporated this into their decision making. At least this is one concern the rest of us don’t have to worry about.